Imants Tillers is on the panel of judges for the sixth Purvītis Prize – Latvia’s most prestigious award for contemporary art. Curated by Daiga Rudzaate, the Purvītis prize showcases the work of eight shortlisted artists in a major exhibition at the Latvian National Museum of Art from 23 March - 9 June, with the winner announced on Friday 12 April. Fellow jurors are Udo Kittelmann, director of the Nationalgalerie, Berlin, Milena Orlova, editor-in-chief of The Art Newspaper Russia, Galila Barzilai Hollander, art collector based in Brussels, Ursula Krinzinger, director of the Galerie Krinzinger, Vienna, Māra Lāce, director of the Latvian National Museum of Art and Jānis Zuzāns, patron of the Purvītis Prize and chairman of the board at SIA Alfor. Two new large-scale canvasboard paintings will be premiered at Art | Basel Hong Kong on Wednesday 27 April. Roslyn Oxley9 Gallery is presenting Amygdala Hijack and The Siege at Booth 1C07 from 27 - 31 March 2019. Amygdala Hijack is based on Malcom Morley’s The Ultimate Anxiety 1978, which depicts a scene of Venice weirdly interrupted by a freight train. The Siege is based on Morely’s Piazza d'Italia with French Knights, 2017, which in turn quotes from the work of the metaphysical painter Giorgio de Chirico. Join us for the Australian premiere of the documentary Thrown into the World, followed by the launch of the publication Imants Tillers: Journey to Nowhere. Museum of Contemporary Art Australia. Places are limited. Please RSVP here. The 64 canvasboard panel painting Study of Louis Nowra, 2018 was unveiled at the National Portrait Gallery, Canberra on Thursday 19 October. The painting will be on display at the National Portrait Gallery as part of the 20/20 exhibition until 10 February 2019. 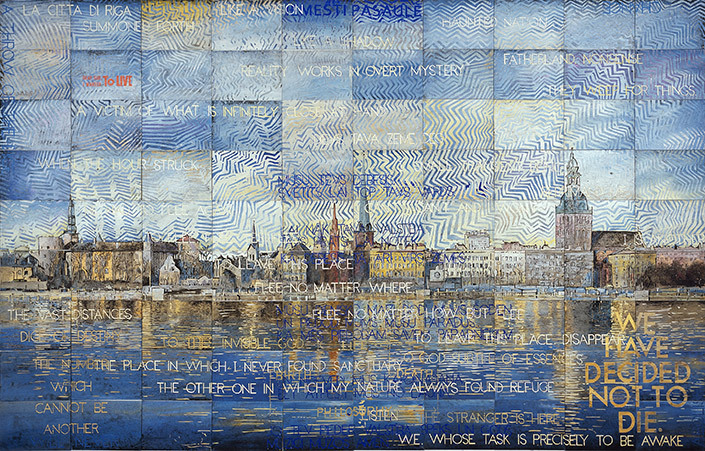 Imants Tillers’ latest exhibition with Arc One Gallery Joy Knows No Mercy, is presented across two locations: ARC ONE Gallery (4 September – 6 October) and Sydney Contemporary (13 – 16 September). In this significant exhibition Tillers employs his signature canvasboards to form a series of profound and expansive tableaux. The monumental Fiction of Place (2018) is the centrepiece of the exhibition. It is the culmination of the artist’s Metafisica Australe series, an important chapter that explores the remarkable aesthetic connection between certain aspects of contemporary Western Desert paintingand European art. Read the Press Release here. 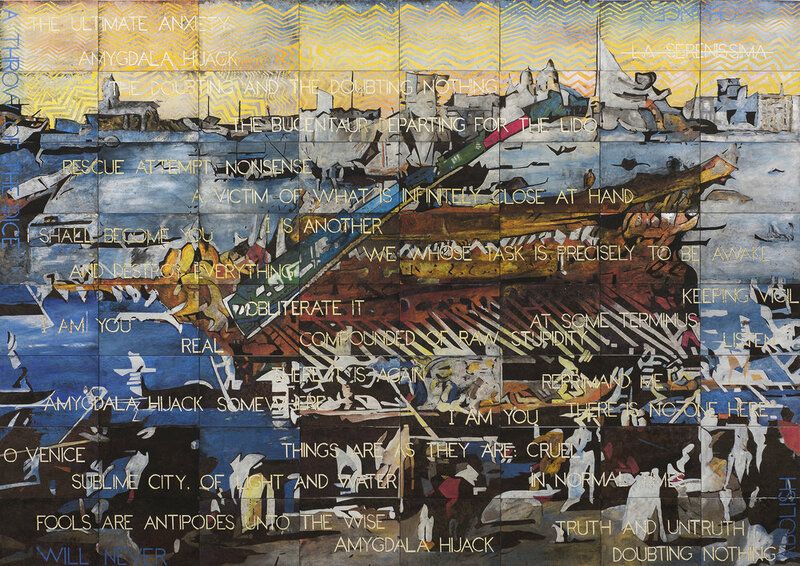 Arc One Gallery will present four new works by Imants Tillers at Stand B04, including the major painting Fiction of Place, 2018 on 132 canvasboards (280 x 427 cm), which draws on Francesco Guardi's painting of Venice in The Louvre, and the work of Papunya Tula artist Kenny Williams Tjampitjinpa. Imants Tillers and Eddie Ayres discuss Tillers' Latvian roots and the retrospective exhibition Journey to Nowhere at the Latvian National Museum of Art. Antra Cilinska also speaks to Eddie from Latvia about the new documentary she directed on Tillers' life and works Thrown into the World. Listen online here. The Philosophy of Doubt tours to the Hamilton Gallery in Victoria. In this exhibition Tillers looks for common ground between aspects of contemporary Western Desert art and the metaphysical paintings of 20th century Italian master, Giorgio de Chirico. The largest exhibition of Tillers' work to-date opened at the Latvian National Museum of Art on Friday 6 July. The opening celebration included performances of two pieces of music by composer Rosalind Page: Being & Time for piano, cello and clarinet, performed by Juris Zvikovs, Eriks Kirsfelds and Egils Sefers and Horizon performed by the Latvian Radio Choir conducted by Kaspars Putnins. View the exhibition installation images here. 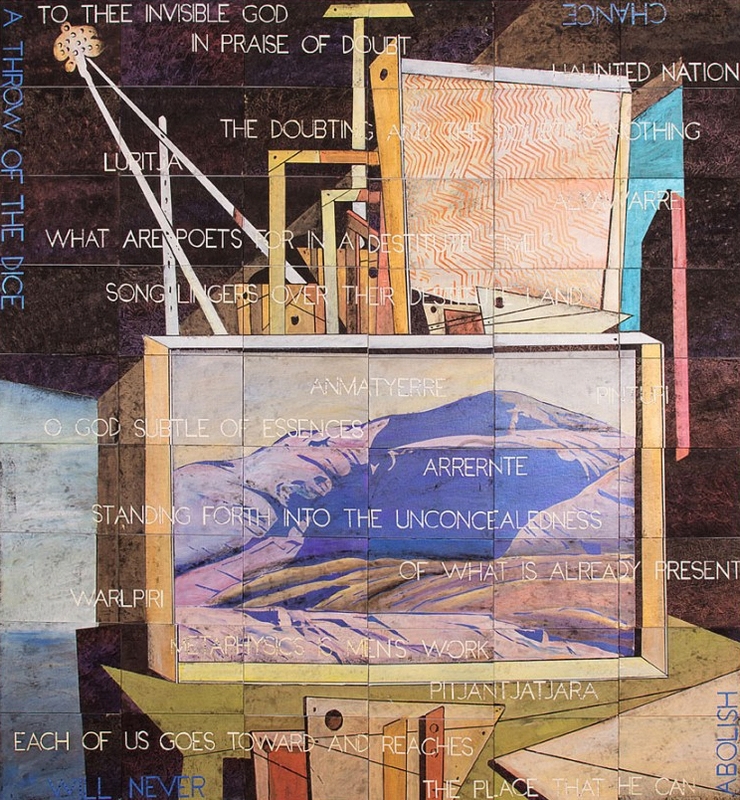 An exhibition of collaborative works by Michael Nelson Jagamara and Imants Tillers to coincide with the unveiling of QAGOMA's proposed acquisition, Metafisica Australe, 2017. For more information, please contact Fireworks Gallery, Brisbane. "No longer invisible: Bringing Australian Art to the TATE Modern", Sydney Morning Herald, 3 April 2018. Photo credit Janie Barrett. An exhibition of 10 large-scale works from the studio collection. The show spans four decades of Tillers career, from the 1980s to the present, and traces the developments, continuities and cumulative power of The Canvasboard System. For more information see the University Gallery, at the University of Newcastle. A major retrospective exhibition will be held at the Latvian National Museum of Art in Riga from 6 July - 30 September 2018 to coincide with the centenary of Latvian independence in 1918. Curated by Elita Ansone, Journey to Nowhere will include 70 works spanning more than four decades from the 1970s to the present. More information. Curated by Paul Greenaway, the works in Philosophy of Doubt span the last ten years of Tillers' practice. The exhibition is on display at the Riddoch Art Gallery, Mount Gambia, from 9 Feb – 18 Mar, 2018.